Achieving success in any career field requires a combination of talent, ambition and hard work. Even then, success is not guaranteed. This is why it takes a certain personality to be an entrepreneur; someone who is driven to wake up everyday and keep working toward their vision even when they are unexpected obstacles, financial challenges and other setbacks that must be faced. 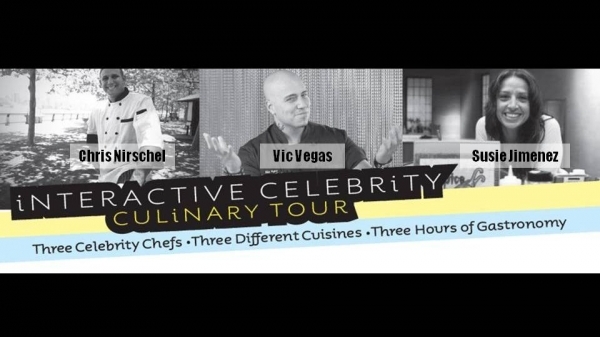 Each of the 3 young chefs involved in the Celebrity Chef Culinary Tour, Chris Nirschel, Vic Vegas and Susie Jimenez are very talented and passionate about cooking. They met each other on the Food Network's reality show "The Next Food Network Star". Each was eliminated from the show (Jimenez remained in the competition the longest), but didn't let this set-back derail their dreams. The Celebrity Chef Culinary Tour was the idea of Chris Nirschel who aside from this weekly event, is the consulting chef at two restaurants in New York's Little Italy (Cafe Napoli, Giovanna's) as well as running an executive catering business for corporate travelers at Teterboro Airport in New Jersey. Nirschel also told VIVE Katerin that he will be introducing an upscale bar menu at Copia in NYC's midtown area.